The news industry has experienced tremendous turmoil in the past few years, and with tremendous turmoil comes new strategies, which put publications’ online experiences front and center. Websites are being redesigned, and mobile apps are being created left and right, which means the news industry is ripe with opportunities for designers with a vision. Before you can have a vision though, you need a lot of inspiration, which is why we wrote this post. In it, we highlight and comment on the best news apps and websites from around the web. Some of the designs are captured from live products, and some are still in development. Ready, set, find your vision. Tubik’s Chief Product Officer created this news portal. She illustrates a great way to display sectors and transitions between scales. Often news portals hide their navigation tools when entering and leaving content. This can leave a user disoriented and confused about where they are in the interface relative to the rest of the content. This interface always keeps its menu around, but nicely transitions into a full screen view as well. The idea of ranking content is not necessarily new, as many different platforms have utilized some sort of upvoting before. However, a rating system for articles – similar to Rotten Tomatoes – is interesting. In the age of content overload, readers appreciate knowing whether an article is worth a read or not. Upvoting systems reduce content overload, but this ranking system suggests an organizational structure for articles that will be worth reading well after they have been published. The transition between calendar and main headlines offers an alternative way to consume content. Although this is a news platform specific to a concert hall, it suggests how similar institutions might align news content with upcoming events. The headline feed offers the featured content quickly, while the zoomed out calendar provides a broader scope of other programming. Both Google Newsstand and Trello cards inspired this design. Can you tell? Salomon’s intent was to reconsider the pull gesture. Typically, the pull gesture is used to refresh the page. Salomon instead directs navigation in multiple directions and scales all with the single gesture type. The result is a smooth transition between menu and content. This editorial prototype focuses more on aesthetic design choices rather than architectural ones. 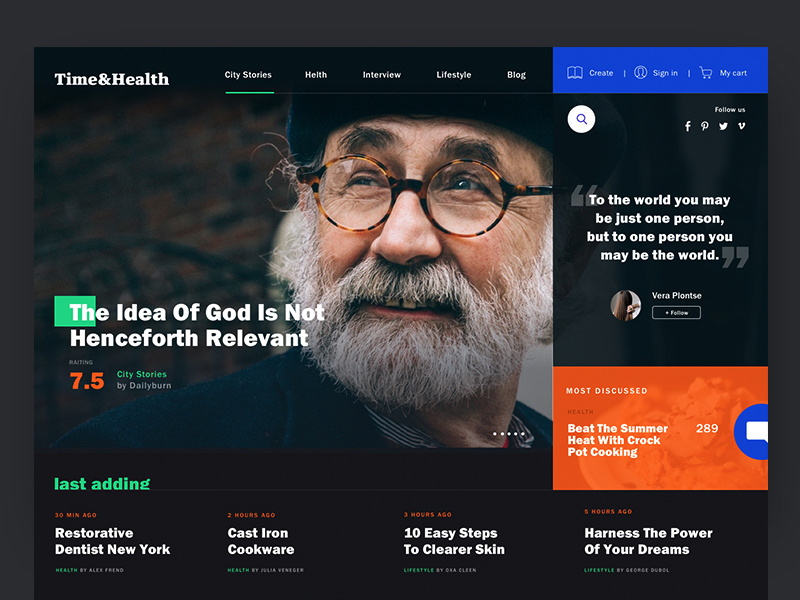 The design harkens to the style of conventional print media, and as a result, it gives the content a serious tone, which many news portals lack. The serif font, which has suited mobile, is easier to read over an extended period of time than the serif fonts, which are more common in most digital interfaces. Too Much Social Media Advertising can Hurt Sales. Yikes!